Post Script take an honest look at pain and healing in their ‘The Light I Can’t Block Out’ EP, an intimate record bustling with life and love. Through every hardship or struggle, there will be a light at the end, there will always be a brighter side, or something good down the line that will come out of a tough situation. Previewed through the singles “Dead Flowers” and “Miles Away,” The Light I Can’t Block Out finds Post Script embracing a refined, dreamy soft rock sound that’s far more Fleetwood Mac than it is Punch Brothers or Norah Jones. Post Script’s expansion into a full band have allowed them to expand creatively, giving their newest songs an energy that simply wasn’t accessible for them three years ago. Meanwhile, Post Script’s lyrical content has never felt stronger. Their songs range from glorious laments of loss, to euphoric embraces of life’s verve. “Dead Flowers” is sung from the perspective of a loved one who’s passed on, and now waits for their love to join them in the beyond. “Lights” opens up about depression, and looking for an anchor to stay afloat (the lights in my eyes are no longer bright… where do they go?). Across this EP, Post Script inject their own humanity alongside a universality that keeps every song and its story feeling relatable, and somehow connected to our own lives – no matter how far detached we may physically seem from this Canadian band. By the time “I’m Trying” brings the EP to its poignant close, we find ourselves aching for more. 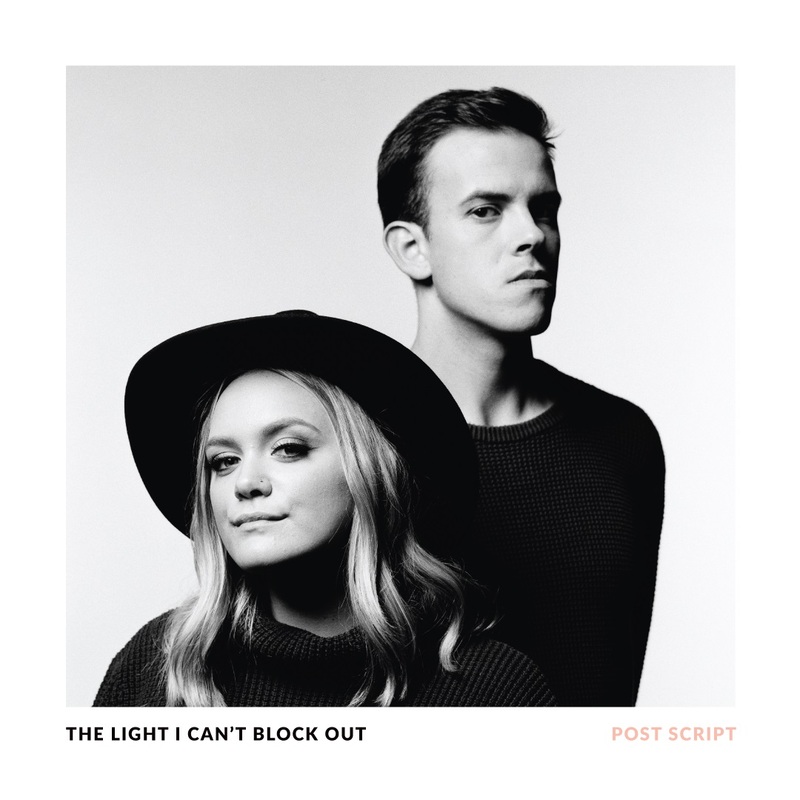 Experience the full record via our exclusive stream, and peek inside Post Script’s The Light I Can’t Block Out EP with Atwood Magazine as the band go track-by-track through the the music and lyrics of their latest record! We live in an old apartment building that faces downtown Edmonton that has an amazing view of the city and has a view like no other. We usually write most of our songs in the living room, where we can see all of the city lights. “Lights” was a song Steph wrote about struggling with depression and trying to find a light to hold onto. Something that will bring happiness, and give some sort of relief. This track kicks off the EP and starts off as a ballad and progresses bit by bit into more of a rock n roll sound. But it reflects the songwriting well, because depression can progress and get harder as you go. While writing this song, we were listening to a lot of Fleetwood Mac, so you can definitely hear that influence on this track. “Dead Flowers” was written as a part two to our song “Dear Marie” from our first record ‘If Not for You.’ “Dear Marie” was written for Steph’s Grandmother she never had the chance to meet because she passed away at a young age from breast cancer. The song was written in the perspective of her Grandfather, who lives on an acreage on his own and has been a widow for thirty years. “Dead Flowers” was written in the perspective of her Grandmother Marie, who in the song, is waiting for her husband to meet her into the unknown. The song is dark, heartbreaking and quite haunting. We wrote this song in one session and never really looked back; we feel like it all came out so easily and in a way we would never be able to recreate. Paul was away playing shows in Saskatchewan when Steph wrote this song. Being a couple for seven years, you end up really relying on each other, and when we’re apart, it can take some time to adjust to be alone. In the end, time apart is always healthy in any relationship, but hopefully this song can help some of those couples who are in a long distance relationship. This track is definitely the most Pop influenced song on the record, but we really love the throwback vibe we created while we were recording this song. Now I’m Gone is a song about leaving a toxic relationship, and being better for it. “Sheryl Crow” is probably my biggest inspiration as a songwriter, because her lyrics are always so direct and clear. We definitely wanted to channel that for this song. I wanted to write this song for all of my friends that have been through terrible relationships where they really lose touch with who they are, and they think it’s normal to be treated so terribly. Hopefully this song can give people the courage to know their self worth and end it. My personal favourite part of this song is Matt Kraus’ (keys) solo, adding him to these tracks definitely gave this record a distinct sound. “I’m Trying” is the last track of the 5 song EP. We wrote this song after meeting with a fellow musician who is a single mother and recently divorced. She tours with her daughter all over the world, and didn’t let the circumstances stop her from creating and sharing her music with the world. But she continued to say how her daughter is the light of her life, and she wouldn’t have it any other way. Being raised by two single parents, I could relate to how hard it is to juggle life, work, and your passion all at once. This song goes out to all the single parents in the world who are trying to make ends meet. Recording this song was so special, we recorded it in one take, live off the floor at the studio. Right before tracking, our drummer Brad Tebble told me to “Play it like you’re sad, Steph” and it really set the mood of the song perfectly.